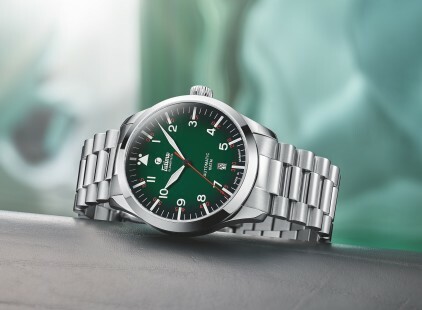 BASELWORLD 2019: High Time | Tutima Glashütte/Sa. BASELWORLD 2019: High Time - Tutima Glashütte/Sa. A stylish entry into the world of Tutima: the Tutima Flieger with stainless steel bracelet and night green dégradé dial. Automatic Cal. Tutima 330. Rotor with gold seal. 25 jewels. Polished screws. 38-hour power reserve after full winding. Ref. no. 6105-30. In addition to the Grand Flieger Classic and Airport series, the Flieger family thus gains a modern entry-level model in a new design that goes perfectly with an active lifestyle. The night green, anthracite or black dials accentuate the masculine note and assure a clear overview. The numerals and the skeletonised hands are coated with Super-LumiNova, while bright baton-shaped indices and the typical pilot’s watch symbol at “12 o’clock” guarantee optimum legibility. Orange or red markings create fresh and individualistic accents. This three-handed wristwatch encases self-winding Tuti-ma Caliber 330, which boasts an 18-karat gold seal on its rotor. The case is pressure-tested to ten atmospheres and equipped with a pane of sapphire crystal in its screwed back. The bold styling of the polished, 41-mm-diameter, stainless steel case continues with an antireflective sapphire crystal, a screw-down crown, a date display, and centrally axial hour- minute- and second-hands. Glashütte watchmaking artistry at an entry-level price: the new Tutima Flieger raises pulse rates – and not only among pilots. 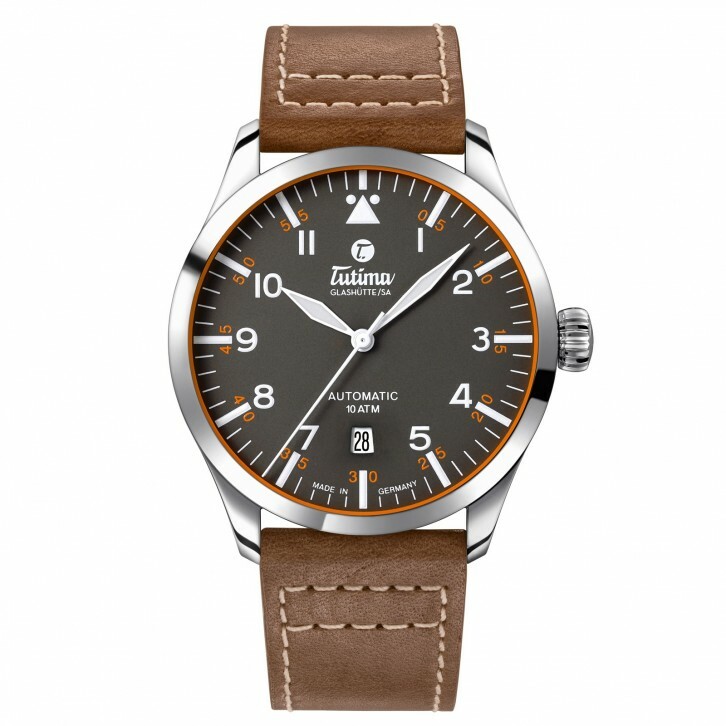 Perfect performance and a perfect price: the Tutima Flieger with classic leather strap. Ref. no. 6105-03.